This next sale, on Saturday February 16th at 6am will feature the newest Ethereal Collection designs with Candy Gold veins - a pale gold over silver chrome. The Nightshade convertible fairy wings below are done in Ultraviolet film, the most transparent and ethereal of them all. There will also be this set of Goblin Princess convertible wings in the Satin White film. Faerie wedding anyone? This slightly opaque satiny film has always seemed like a good pick for a fairy bride. More to come, so make sure you’re subscribed to this News blog, or signed up for the email list to get notified of all the available goodies! Merry Christmas eve! The Elvina style as Sugarplum Fairy Wings will be available tonight at 7pm PST. The Elvina design gets the extra fancy treatment with my digitally hand painted butterfly-esque pattern on the iridescent Lilac film, gilded with my original flourish design at the tips in amethyst colored metal foil, and further embellished with an assortment of Swarovski crystals! Veins are silver chrome. These have a small blemish, a tiny spot where some foil got stuck on the back of the left upper panel so they will be priced just under what they would have been without that. The last photo shows the spot, thankfully it’s not super noticeable and it’s at least a shiny one. The wingspan from tip to tip at the widest point measures roughly 41 inches wide. You may want to take extra care with these, don't make them rough and tumble wings. The amethyst foil may be prone to scratching if anything sharp rubs it, and since applying a sealant would have changed the glossiness and contrast between the foil and the vinyl I prefer not to use that. Once you get them, you can try spraying a clear sealant but it's possible it might affect the foil color so be forewarned. I’m actually including the little flowers that go onto the base joint since the ones I had matched this so perfectly. They will be listed in the usual place in my Shopify store. Sale this Sunday 11/18 at 8pm PST! 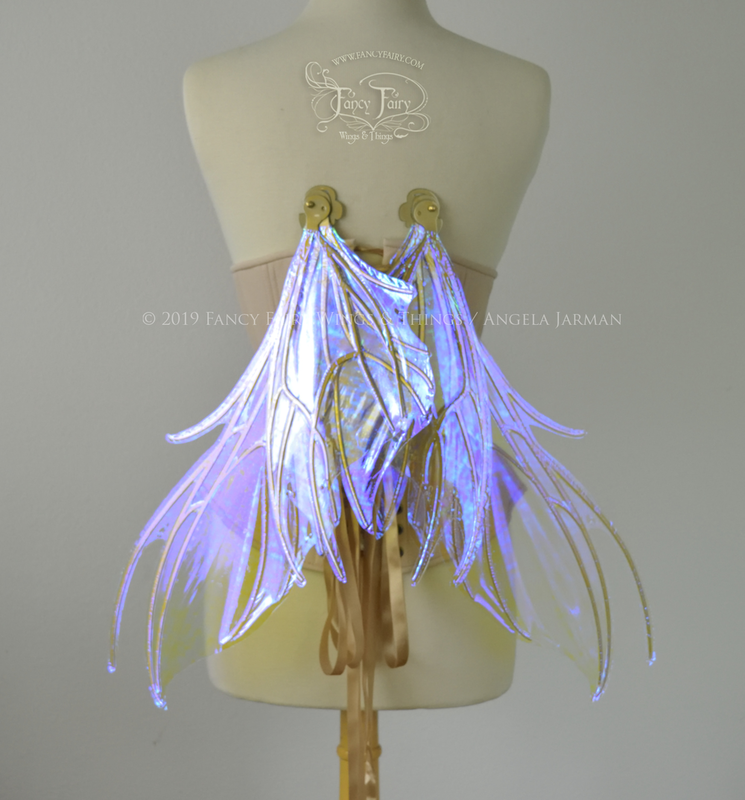 I’ve done a set of celestial themed Datura wings before, and this is a similar set but a bit darker and more unseelie with the Chameleon Cherry Violet veins and a new oil slick metal leaf embellishment on the tips with Swarovski crystal accents. This set uses the same painted pattern, but has been laminated instead on the Aquamarine film which is more transparent and reflects blue/green.